Thanks so much Kelly for sharing your talent with us this month! And now for the winners of our April Challenge. We used Random.org to choose 2 winner. The first prize of the YNS stamp pack goes to # 34 which is Melyssa!!!! The second prize of the KK stamp pack goes to # 15 which is Mary F!!! Ladies, please email lora at onecrazystamper dot com to claim your prizes! And thanks to everyone who played along! Check back tomorrow for our May Challenge. It's Sue here with my last post of the month for OCS. I have used the Brave Captain stamp from the Nellie Snellen Young Rebels collection. Very fitting for a grandson who will soon be turning 3.
challenge. Do check out Lora's store OCS for the latest arrivals. I carved out some crafty time and I really needed it! I used the adorable Gadget Girl from Kraftin Kimmie Stamps. I loved coloring her! Of course when I use copics as my coloring medium I ONLY use Memento Tuxedo Black. I have this in the regular size pad and the small one as well. This way you get the right amount of coverage no matter what you are stamping. I am thinking she is going to be a thank you card. Only a few more days to enter this months chalenge! Today I have a Kraftin Kimmie stamp: Calla Lily that I finally got inky! I stamped her with Memento Tuxedo black ink unto Xpress It cardstock. I cut her out with a Spellbinders die and layered her. Label was made with Spellbinder's Becky Fleck Labels & Tag Page map die. 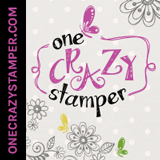 All items are available at One Crazy Stamper. I added some bling for fun! Don't forget our monthly challenge is still going on! Check out all Lora's new items at One Crazy Stamper. Hi everyone Cindy here Welcome to my One Crazy Stamper card. Don't forget to enter this month's Boy / Men challenge for One Crazy Stamper and check out the amazing goodies in the OCS store. Masculine Card and a Tip. Hi all, Madge here with my last post for the month of April for OCS. Today I’m going to share a (very simple) tutorial on how to make cuts in Patterned Paper to make it work with your image while also adding an element. 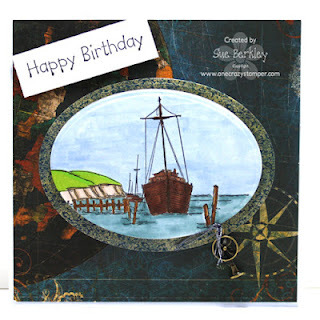 This will also take you Step-by-step on how I made this card. Prepare to sit a while! First: Here is a little tip that I discovered while doing my nails (don’t ask!). This little bottle of “Base Coat” Nail Polish is absolutely fantastic for making your black lines “POP” from your colored images!!! - comes with it’s own little brush!! - from the $$$ store. AND it also adds a slight gloss and stiffens your cut image!! WOW – all that from an sloppy mistake errrrr, experiment. Ask me how I know that, in fact the blacks became more vibrant?. . . . well, while the puddle, ummmmm, application was drying, I screeched “OMG “ ummmm, hypothesized the abnormal change in depth of color and made a mental note to myself . . . . clumsy jerk . . . phew, well that turned out ok.
OK, on with my tutorial…….. 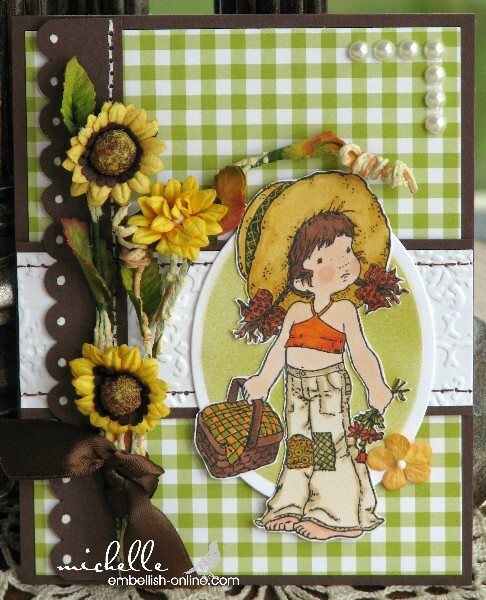 I started with this little image of Snoesjes - Snoes with Bird, from Marianne Designs – available at OCS. This little fella really grew on me………. I stamped the image onto XPress It Blend Cardstock, with Memento Tuxedo Black , colored it with Copic Markers and fussy cut him out. (Sometimes a light bulb goes on, sometimes a candle flickers) Here’s what I did to bring my card to fruition. 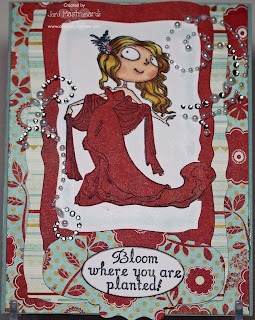 I sponged Tim Holtz Distress Ink, “Tea Dye” to all the papers to give a Vintage look. Then I began to place color blocks until I was satisfied with the result. The red color block was positioned under the cut-out. I also penciled in “H-A-P-P-Y B-I-R-T-H-D-A-Y” onto the banner. 3 Dimensional foam squares were placed on back side of image. I added the elements, (stars, feather and twine) to the card and placed the image over the twine – placing the sentiment in between the twine to give a matted look. Above, is the finished result ~ Colorful, masculine and regular postage rate thickness for mailing. I also added papers to the inside of the card – for more “eye candy”. Til Next Time. “Stamp up a storm, ink up a wish – and send it on to brighten someone’s day”. Terrific Tuesday is here again and it's time for me to do another tutorial for One Crazy Stamper. If you love your Copic markers and you 've mastered the rules of coloring, it's now time to experiment and break some of those rules and learn a few new ones!! Most of you were taught to pick blending groups with the same letter, same first number and then two or three digits difference in the last number, now it's time to have some fun! Start by stamping an image that is large enough to practice new blending techniques several times. For my practice sheet I used Art Impressions Birthday Whoot Set. The first owl shows you the traditional method of blending using E33, E35, and E37, while the second owl is colored with E33, E37, YR27, and BV04 for the deep shadows. Notice that the second owl has more subtle shading. The second set of owls shows the + 10 + 2 rule with the first owl colored with R00 ( + 10 + 2 ), R12 ( +10 + 2 ), and R24, and the second owl is E01 ( + 10 +2 ), E13 ( +10 + 2 ), and E25 ( +10 + 2). Using this method will give your shading more depth. This little cutie also follows the + 10 + 2 rule in bright blue! The next experiment with colors is to color outside the color family which can be a real blast, and the results are awesome!! Look at these interesting color combinations. The last image shows an owl colored outside the usual color family and one using the traditional method! Now it's your turn to break out your Copic markers and have some fun exploring some new coloring options!! You'll have as much fun as I did - please let us know how your own experiments turned out! Happy Monday! I caught myself a dandy cold over the weekend..and have no new cards to share with you for my One Crazy Stamper post....so I went back in my archives and am sharing some cards using Stampavie images that I did for a store that is no longer in business. I could have cropped off my watermark...but I hope Lora will forgive me and y'all will overlook it this one time since I think these little ladies are just too sweet to not share with you! The GREAT thing is...you can still get Picnics of Daisies, and the Spring is Back image is very similar in style to the second card's image! I colored all my images with Copic markers. It's time again for another Sunday post for OCS. 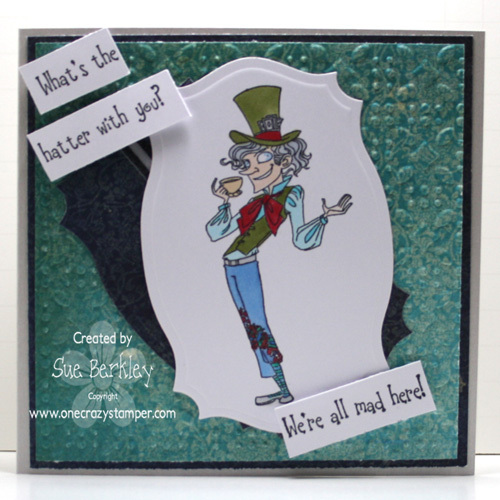 The week has been busy; and to add to the mix the males and not the grandsons have been rather exasperating, which makes the Mad Hatter stamp from Kraftin Kimmie a perfect choice. Don't forget to enter this month's Boys / Men challenge. Do check out Lora's store One Crazy Stamper for some amazing deals and new products that are arriving daily. It is crazy busy in my neck of the woods and the weather has been divine! I hope things are good with everyone else! I was able to carve out some crafty time this week and I could NOT wait to play with this adorable stamp by Belles n Whistles called Tea Time. I also went a different way and instead of using my copics I used my reinkers and a water brush. For this I stamped with Staz-on Black. I haven't colored this way in so long that it was fun to try it again and i love the colors. Not sure I chose the right design paper but it looked good in my head! I also used large circle nestabilitites and circle lacy nesties! I love the look of having it in the corner and cutting some of it! Hope you liked it and see you next week! Today I have this fabulous stamp from My Favorite Things called The Rainbow Will Come available from One Crazy Stamper. I stamped my image with Memento Black ink unto Xpress It Card stock. I added Rangers Glossy Accents to the puddle. Don't forget our month long masculine challenge at OCS blog. Another Wonderful Wednesday and the weatherman says it will be sunshine!! The card that I made was actually a Birthday Card for a friend who loves Purple and loves Butterflies………… Many moons ago I thought it might be an Easter card, but it didn’t happen. But Tilda can have bunnies any day of the year – right?? This stamp is called Tilda with Bunny and is available at OCS. I am sooo passionate about these little Magnolia stamps. This is an Easel Card, which I love to do. I even managed to do some actual STITCHING on it!! (My sewing machine was in shock when I turned it’s light on). lol The papers I chose are from Prima Marketing, “Sweet Fairy” collection. I love their subtle look. As I’ve mentioned before, I really admire people that can put patterned papers together - when I do it looks like a dog’s breakfast. BUT, I did it with this card!! 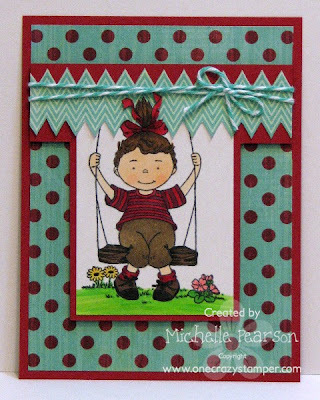 Masculine or a male themed card or project, that's the theme for One Crazy Stamper's monthly challenge. Today I chose two Nellie Snellen images to feature - I was so happy when OCS started to carry these little cuties. The image on the front of the card is "Indian Warrior", while the inside has "Yippie-Yeah" ( Cowboy on Horse ). Both images were stamped with Memento Tuxedo Black ink, on Copic's Xpress It cardstock, then colored with Copics. The dp is from my stash, and the sentiment is from an older stamp set from Waltzingmouse. The motifs are from the Ironworks Spellbinders die set. You still have time to enter this month's challenge, so check out the OCS store and get creative. Have a terrific day!!!! Happy Monday! 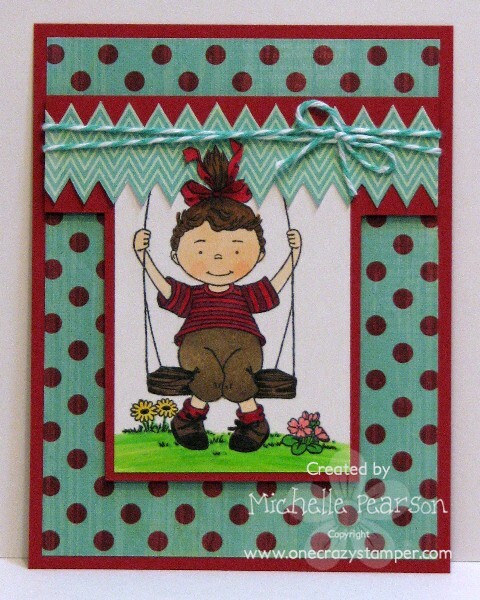 Today's card for One Crazy Stamper features a Stampavie image called In The Park. I paired up my image with some Lily Bee Design papers from the Head Over Heels collection. I did a tad of fussy cutting to make a fun chevron element to *hang* my swing from. A touch of baker's twine finishes off my card. I colored my image with Copic Markers: E49, E47, E44, E43, E59, E57, ﻿YG17, YG07, YG03, R39, R37, R32. It's time for another Sunday post for One Crazy Stamper. 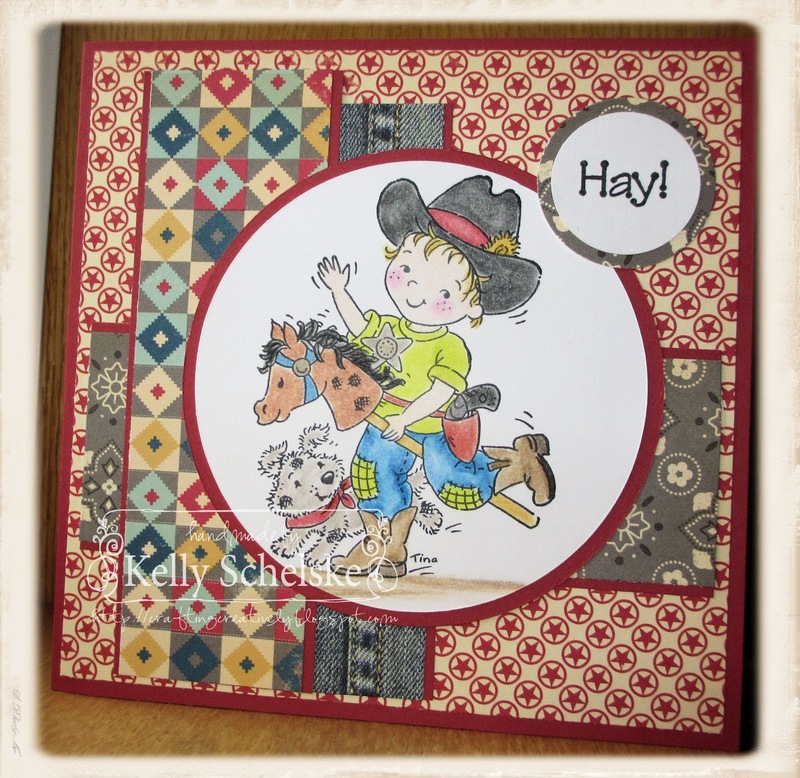 I have used the Backyard Background stamp from Art Impressions for the main focal point. 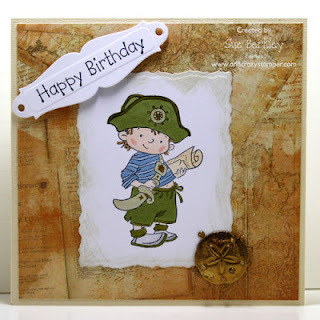 There is still time to enter this month's challenge which is masculine and while you are, check out the great sales that Lora has at One Crazy Stamper. I used the adorable Princess Tales! She is colored with copics and instead of creating a neutral shadow I used my lightest blue to create a shade for her. Using different greens I created the grass by quick and light brush strokes. I used a yellow copic to create little dandelion marks on the ends of some of the grass. This is going to make a great birthday card for one of the little ones in our big extended family! April Guest Designer Kelly S.